Skin grafting dates back >3000 years to India, where forms of the technique were used to resurface nasal defects in thieves who were punished for their crimes with nose amputation. Full thickness skin graft can be taken from the following sites except – (AIIMS 87) ? Free skin graft is rejected on – (AIMS 89) ? Each technique has advantages and disadvantages. Selection of a particular technique depends on the requirements of the defect to be reconstructed, the quality of the recipient bed, and the availability of donor site tissue. Split-thickness skin grafting represents the simplest method of superficial reconstruction in plastic surgery. Many of the characteristics of a split-thickness graft are determined by the amount of dermis present. Less dermis translates into less primary contraction (the degree to which a graft shrinks in dimensions after harvesting and before grafting), more secondary contraction (the degree to which a graft contracts during healing), and better chance of graft survival. Thin-split grafts have low primary contraction, high secondary contraction, and high reliability of graft take, often even in imperfect recipient beds. Thin grafts, however, tend to heal with abnormal pigmentation and poor durability compared with thick-split grafts and full-thickness grafts. Thick-split grafts have more primary contraction, show less secondary contraction, and may take less hardily. Split grafts may be meshed to expand the surface area that can be covered. This technique is particularly useful when a large area must be resurfaced, as in major burns. Meshed grafts usually also have enhanced reliability of engraftment, because the fenestrations allow for egress of wound fluid and excellent contour matching of the wound bed by the graft. The fenestrations in meshed grafts re-epithelialize by secondary intention from the surrounding graft skin. The major drawbacks of meshed grafts are poor cosmetic appearance and high secondary contraction. Meshing ratios used usually range from 1:1.5 to 1:6, with higher ratios associated with magnified drawbacks. By definition full-thickness skin grafts include the epidermis and the complete layer of dermis from the donor skin. The subcutaneous tissue is carefully removed from the deep surface of the dermis to maximize the potential for engraftment. Full-thickness grafts are associated with the least secondary contraction upon healing, the best cosmetic appearance, and the highest durability. Because of this, they are frequently used in reconstructing superficial wounds of the face and the hands. These grafts require pristine, well-vascularized recipient beds without bacterial colonization, previous irradiation, or atrophic wound tissue. Special considerations in choosing a skin graft donor site include skin quality and color from the donor region that will best match the recipient site. For example, skin harvested from the blush zone above the clavicles is best suited for facial grafting. Skin grafts harvested from areas caudal to the waist will result in tallow discoloration and possible unwanted hair growth. Because split-thickness donor sites will permanently scar, it is wise to choose a donor site that can be concealed. When a large amount of graft is needed, the thighs and buttocks are areas that can be hidden with everyday clothes. The inner arm and groin crease are each fine sources for full-thickness grafts because both areas offer relatively glabrous skin sources, the donor sites of which can be easily hidden with clothes. One often overlooked split-thickness donor site is the scalp, taking extreme care to avoid taking the graft below the level of the hair follicle; this donor site heals quickly, painlessly, and with imperceptible scar consequences. Sabiston :- The skin graft must be applied to a well-vascularized recipient wound bed. It will not adhere to exposed bone, cartilage, or tendon devoid of periosteum, perichondrium, or peritenon, respectively, or devoid of its vascularized perimembranous envelope.There are three steps in the “take” of a skin graft: imbibition, inosculation, and revascularization. Imbibition occurs up to 48 hours after graft placement and involves the free absorption of nutrients into the graft. Inosculation designates the time period when donor and recipient capillaries become aligned. There remains a debate as to whether new channels are formed or if preexisting channels reconnect. Finally, after about 5 days, revascularization occurs, and the graft demonstrates both arterial inflow and venous outflow. Time period and Graft take not well explained in bailey . Sabiston:- By examining the skin graft before the fourth postoperative day, a hematoma or seroma can be evacuated, and the mechanical obstruction to revascularization of the graft is thus removed. Some surgeons make stab incisions in the graft preemptively to create small outlets for fluid to drain from beneath the graft, a technique know as pie crusting. Others might use a mesh expander device, which creates a chain-link fence pattern in the graft. Although these methods may provide egress portals for serous fluid or blood, an unsightly meshed pattern results, making this technique unsuitable for aesthetic reconstruction. Split grafts may be meshed to expand the surface area that can be covered. This technique is particularly useful when a large area must be resurfaced, as in major burns. Meshed grafts usually also have enhanced reliability of engraftment, because the fenestrations allow for egress of wound fluid and excellent contour matching of the wound bed by the graft. The fenestrations in meshed grafts re-epithelialize by secondary intention from the surrounding graft skin. The major drawbacks of meshed grafts are poor cosmetic appearance and high secondary contraction. Meshing ratios used usually range from 1:1.5 to 1:6, with higher ratios associated with magnified drawbacks. Graft take is only possible at well-vascularised recipient sites. Grafts will not take on bare bone, bare tendon or cartilage, but can survive on periosteum, paratenon and perichondrium. The graft must remain adherent to the bed until it revascularises; shearing forces must be eliminated. Meti­culous care with suturing and dressings is essential. Where grafts are applied over mobile areas appropriate splintage must be used. 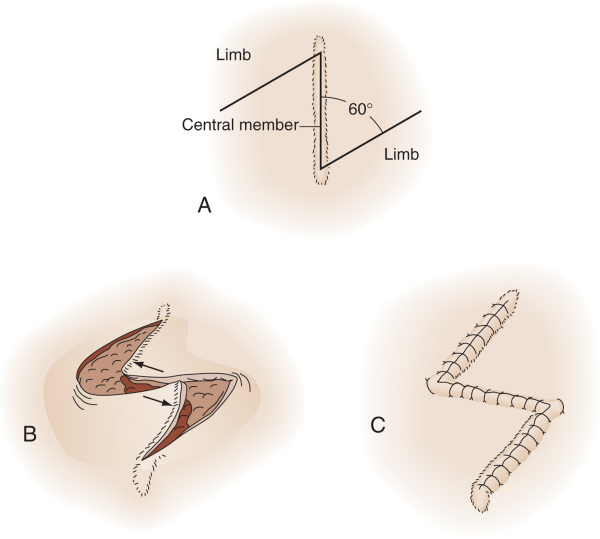 Limbs that have been grafted should be elevated to reduce venous pressure during the process of revascularisation. Haemostasis at the recipient site must be good to prevent bleeding beneath the graft resulting in its elevation by clot and failure of take. Skin grafts can be stored in a refrigerator at 40C for 2 weeks for delayed application. Grafts take well on granulation tissue, but excessive conta­mination with bacteria will prevent take. Streptococci at levels above 105 microorganisms per gram of tissue will result in graft loss. Preparation of the bed with dressings may help; it may be necessary to excise the granulation tissue. A flap is defined as a partially or completely isolated segment of tissue perfused with its own blood supply. Flaps are the reconstructive option of choice when a padded and durable cover is needed to reconstruct an integumentary defect over vital structures, tissues devoid of perivascular membrane, or implants. Flaps vary greatly in terms of complexity from simple skin flaps with a random blood supply to microvascular free flaps containing composite tissue. Numerous schemes exist to classify flaps. Flaps may be classified based on the type of tissue contained in the flap: fasciocutaneous, musculocutaneous, or osteocutaneous flaps. Flaps are also described based on their design and method of transfer: advancement, rotation, transposition, interpolation, or pedicled flaps. Flaps may be further defined by the source of their blood supply: random, axial, or free. Random flaps rely on the low perfusion pressures found in the subdermal plexus to sustain the flap and not a named blood vessel. 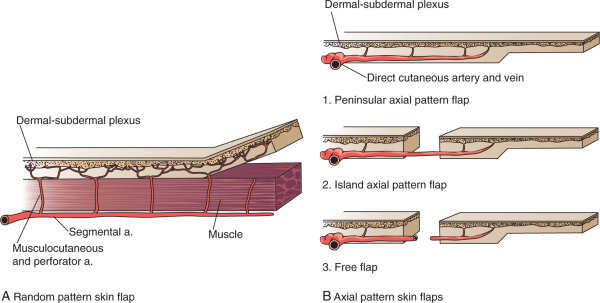 Nevertheless, random flaps are used widely in reconstruction of cutaneous defects, including those resulting from Mohs excision of cutaneous malignancies. These local flaps recruit adjacent tissue based on geometric design patterns. 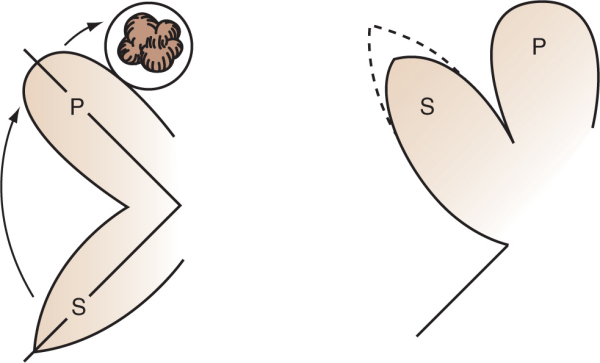 Advancement and rotation flaps represent commonly used random-pattern skin flaps. The Z-plasty, bilobed flap, rhomboid, and V-Y (or Y-V) advancement flaps are commonly used random flaps. Z-plasty involves transposing two adjacent triangular flaps to redirect and lengthen an existing scar (the central limb).The angles of the Z-plasty can be increased to provide greater length. Typically a 60-degree angle is used that lengthens the central limb by 75%.The bilobed flap is commonly used for nasal reconstruction; here, a larger primary and smaller secondary flap are transposed into adjacent defects borrowing the loose adjacent tissue to close the defect . 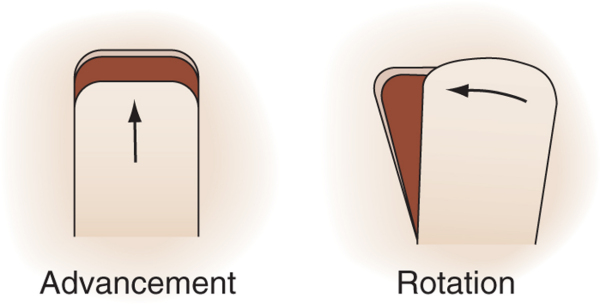 The rhomboid flap described by Limberg uses a 60- and 120-degree parallelogram to transpose tissue into a diamond-shaped defect. It is an extremely versatile flap option and the workhorse for most plastic surgeons. Finally, the V-Y (or Y-V) advancement flaps are commonly used to lengthen scars around the nose and mouth. A backcut at the base of a flap may decrease tension at a flap’s tip, creating a greater arc of rotation; overzealous back cut or tension at flap inset can each cause ischemia to the flap and threaten its survival. Keratoacanthoma (molluscum sebaceum) arises as a rapid proliferation of squamous epidermal cells. The nodule grows rapidly for 6—8 weeks at which time it usually begins to resolve spontaneously. 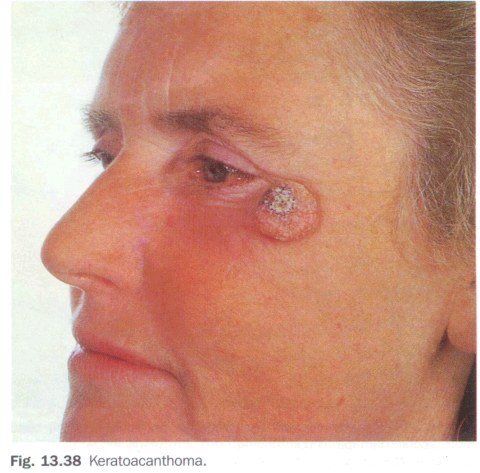 Keratoacanthoma must be distinguished from SCC. Usually rapid evolution to relatively large size, irregular crater shape and keratotic plug, and the undamaged surrounding skin make a distinction possible. Spontaneous healing further confirms the diagnosis. Histologically, it is difficult to differentiate between a keratoacanthoma and SCC. There is also a possibility of a highly anaplastic SCC behaving like a keratoacanthoma. Excision biopsy is mandatory if the diagnosis is in doubt as curetted specimens yield poor sections. Vascular malformations are developmental errors in blood vessel formation. Malformations do not regress and slowly enlarge. They should be named after the predominant blood vessel forming the lesion .Table helps differentiate vascular malformations from true hemangiomas. From Eichenfield LF, Frieden IJ, Esterly NB: Textbook of Neonatal Dermatology. Philadelphia, WB Saunders, 2001, p 337. Port-wine stains are present at birth. These vascular malformations consist of mature dilated dermal capillaries. The lesions are macular, sharply circumscribed, pink to purple, and tremendously varied in size .The head and neck region is the most common site of predilection; most lesions are unilateral. The mucous membranes can be involved. As a child matures into adulthood, the port-wine stain may become darker in color and pebbly in consistency; it may occasionally develop elevated areas that bleed spontaneously. True port-wine stains should be distinguished from the most common vascular malformation, the salmon patch of neonates, which, in contrast, is a relatively transient lesion .When a port-wine stain is localized to the trigeminal area of the face, specifically around the eyelids, the diagnosis of Sturge-Weber syndrome (glaucoma, leptomeningeal venous angioma, seizures, hemiparesis contralateral to the facial lesion, intracranial calcification) must be considered .Early screening for glaucoma is important to prevent additional damage to the eye. Port-wine stains also occur as a component of Klippel-Trenaunay syndrome and with moderate frequency in other syndromes, including the Cobb (spinal arteriovenous malformation, port-wine stain), Proteus, Beckwith-Wiedemann, and Bonnet-Dechaume-Blanc syndromes. In the absence of associated anomalies, morbidity from these lesions may include a poor self-image, hypertrophy of underlying structures, and traumatic bleeding. The most effective treatment for port-wine stains is the pulsed dye laser (PDL). This therapy is targeted to hemoglobin within the lesion and avoids thermal injury to the surrounding normal tissue. After such treatment, the texture and pigmentation of the skin are generally normal without scarring. Therapy can begin in infancy when the surface area of involvement is smaller; there may be advantages to treating within the 1st year of life. Masking cosmetics may also be used. Nelson:- Lymphangioma (cystic hygroma) is a mass of dilated lymphatics. Some of these lesions also have a hemangiomatous component .Surgical treatment is complicated by a high incidence of recurrence. Intralesional sclerosing with OK-432, a streptococcal derivative, has been used successfully in selected patients. Macrocystic lesions appear to respond better than microcystic lymphangiomas to sclerotherapy. Lymphatic dysplasia may cause multisystem problems. These include lymphedema, chylous ascites, chylothorax, and lymphangiomas of the bone, lung, or other sites. Bailey:- Cystic hygroma:-Cystic hygroma is an abnormal lymph-filled, often multilocular, space which usually presents in childhood as a soft, brilliantly transluminable swelling in the base of the neck. It is also found in the head and inguinal regions as they develop from primitive lymph cisterns. It behaves like a benign tumour and grows gradually in size, leading to cosmetic problems and compression of surrounding structures. Recurrence is common after simple aspiration and injection of sclerosant. Excision is technically challenging due to the large number of vital structures in the vicinity. Sabiston:-A cystic hygroma is a lymphatic malformation that occurs as a result of a maldeveloped localized lymphatic network, which fails to connect or drain into the venous system. Most (75%) involve the lymphatic jugular sacs and present in the posterior neck region .Another 20% occur in the axilla, and the remainder are found throughout the body, including the retroperitoneum, mediastinum, pelvis, and inguinal area. Roughly 50% to 65% of hygromas present at birth, and most become apparent by the second year of life. Because hygromas are multiloculated cystic spaces lined by endothelial cells, they usually present as soft, cystic masses that distort the surrounding anatomy. The indications for therapy are obviously cosmetic. In addition, the hygroma may expand to compress the airway, resulting in acute airway obstruction. Prenatal recognition of a large cystic mass of the neck is associated with significant risk to the airway, greater association with chromosomal abnormalities, and higher mortality rates. Improved fetal imaging modalities may allow for intervention at the time of delivery based on principles of pharmacologic maintenance of placental circulation until endotracheal intubation is achieved. This technique is referred to as the ex utero intrapartum therapy (EXIT) procedure.and is discussed later in this chapter. In addition to accumulating lymph fluid, hygromas are prone to infection and hemorrhage within the mass. Thus, rapid changes in the size of the hygroma may necessitate more urgent intervention. Complete surgical excision is the preferred treatment; however, this may be impossible because of the hygroma infiltrating within and around important neurovascular structures. Careful preoperative magnetic resonance imaging (MRI) to define the extent of the hygroma is crucial. Operations are routinely performed with the aid of loupe magnification and a nerve stimulator. Because hygromas are not neoplastic tumors, radical resection with removal of major blood vessels and nerves is not indicated. Postoperative morbidity includes recurrence, lymphatic leak, infection, and neurovascular injury. Injection of sclerosing agents such as bleomycin or the derivative of Streptococcus pyogenes OK-432 have also been reported to be effective in the management of cystic hygromas. Intracystic injection of sclerosants appears to be most effective for macrocystic hygromas, as opposed to the microcystic variety. Wounds that are chronically inflamed and do not proceed to closure are susceptible to the development of squamous cell carcinoma .Originally reported in chronic burn scars by Marjolin,other conditions have also been associated with this problem, including osteomyelitis, pressure sores, venous stasis ulcers, and hidradenitis. The wound appears irregular, raised above the surface, and has a white, pearly discoloration. The premalignant state is pseudoepitheliomatous hyperplasia. If this report is obtained on a biopsy specimen, the biopsy is repeated because squamous cell carcinoma may be present in other areas. Oriental sore (syn. Delhi boil, Baghdad sore, etc. ):-This disease is due to infection by a protozoal parasite, Leishmania tro pica, and is a common condition in Eastern countries which is occasionally imported to Western zones. Basal Cell Carcinoma BCC is a malignancy arising from epidermal basal cells. The least invasive of BCC subtypes, superficial BCC, classically consists of truncal erythematous, scaling plaques that slowly enlarge. This BCC subtype may be confused with benign inflammatory dermatoses, especially nummular eczema and psoriasis. BCC can also present as a small, slow-growing pearly nodule, often with small telangiectatic vessels on its surface (nodular BCC). The occasional presence of melanin in this variant of nodular BCC (pigmented BCC) may lead to confusion clinically with melanoma. Morpheaform (fibrosing) BCC and micronodular BCC, the most invasive subtypes, manifest as solitary, flat or slightly depressed, indurated, whitish or yellowish plaques. Borders are typically indistinct, a feature associated with a greater potential for extensive subclinical spread. Squamous Cell Carcinoma Primary cutaneous SCC is a malignant neoplasm of keratinizing epidermal cells. SCC can grow rapidly and metastasize. The clinical features of SCC vary widely. 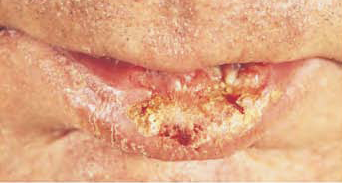 Commonly, SCC appears as an ulcerated erythematous nodule or superficial erosion on the skin or lower lip, but it may present as a verrucous papule or plaque. Overlying telangiectasias are uncommon. The margins of this tumor may be ill-defined, and fixation to underlying structures may occur. Cutaneous SCC may develop anywhere on the body but usually arises on sun-damaged skin. 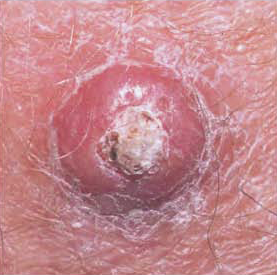 A related neoplasm, keratoacanthoma, typically appears as a dome-shaped papule with a central keratotic cra-ter, expands rapidly, and commonly regresses without therapy. This lesion can be difficult to differentiate from SCC. Actinic keratoses and cheilitis, both premalignant forms of SCC, present as hyperkeratotic papules on sun-exposed areas. 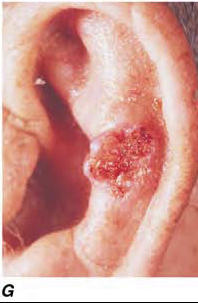 The potential for malignant degeneration in untreated lesions ranges from 0.25 to 20%. Bowen’s disease, an in situ form of SCC, presents as a scaling, erythematous plaque. Treatment of premalignant and in situ lesions reduces the subsequent risk of invasive disease. Rx:- SQUAMOUS CELL CARCINOMA The therapy of cutaneous SCC should be based on an analysis of risk factors influencing the biologic behavior of the tumor. These include the size, location, and degree of histologic differentiation of the tumor as well as the age and physical condition of the patient. Surgical excision, MMS, and radiation therapy are standard methods of treatment. Cryosurgery and ED&C have been used successfully for premalignant lesions and small primary tumors. Metastases are treated with lymph node dissection, irradiation, or both. 13-cis-retinoic acid (1 mg orally every day) plus INF-α (3 million units subcutaneously or intramuscularly every day) may produce a partial response in most patients. Systemic chemotherapy combinations that include cisplatin may also be palliative in some patients. as the head, neck, hands, and arms are other typical sites of involvement. cells present normally in the epidermis and sometimes in the dermis. lower leg (from knee to ankle) are common sites. An alternative prognostic scheme for clinical stages I and II melanoma, proposed by Clark, is based on the anatomic level of invasion in the skin. Level I is intraepidermal (in situ); level II penetrates the papillary dermis; level III spans the papillary dermis; level IV penetrates the reticular dermis; and level V penetrates into the subcutaneous fat. The 5-year survival for these stages averages 100, 95, 82, 71, and 49%, respectively. Any pigmented cutaneous lesion that has changed in size or shape or has other features suggestive of malignant melanoma is a candidate for biopsy. The recommended technique is an excisional biopsy, as that facilitates pathologic assessment of the lesion, permits accurate measurement of thickness if the lesion is melanoma, and constitutes treatment if the lesion is benign. For large lesions or lesions on anatomic sites where excisional biopsy may not be feasible (such as the face, hands, or feet), an incisional biopsy through the most nodular or darkest area of the lesion is acceptable; this should include the vertical growth phase of the primary tumor, if present. Incisional biopsy does not appear to facilitate the spread of melanoma. The following margins can be recommended for primary melanoma: in situ: 0.5 cm; invasive up to 1 mm thick: 1.0 cm; >1 mm: 2.0 cm. For lesions on the face, hands, and feet, strict adherence to these margins must give way to individual considerations about the constraints of surgery and minimization of morbidity. In all instances, however, inclusion of subcutaneous fat in the surgical specimen facilitates adequate thickness measurement and assessment of surgical margins by the pathologist. Trophic ulcers [trophe (Greek) = nutrition] are due to an impairment of the nutrition of the tissues, which depends upon an adequate blood supply and a properly functioning nerve supply. Ischaemia and anaesthesia therefore will cause these ulcers. Thus, in the arm, chronic vasospasm and syringomyelia will cause ulceration of the tips of the fingers (respectively painful and painless). In the leg, painful ischaemic ulcers occur around the ankle or on the dorsum of the foot. Neuropathic ulcers due to anaesthesia (diabetic neuritis, spina bifida, tabes dorsalis, leprosy or a peripheral nerve injury) are often called perforating ulcers .Starting in a corn or bunion, they penetrate the foot, and the suppuration may involve the bones and joints and spread along fascial planes upwards, even involving the calf. Nonspecific ulcers are due to infection of wounds, or physical or chemical agents. Local irritation, as in the case of a dental ulcer, or interference with the circulation, e.g. varicose veins, are predisposing causes. A healing, nonspecific ulcer has a shelving edge. It is pearly, rolled or rampant if a rodent ulcer, and raised and everted if an epithelioma, under­mined and often bluish if tuberculous, vertically punched out if syphilitic. Schwartz:- Pyoderma gangrenosum is a relatively uncommon destructive cutaneous lesion. Clinically, a rapidly enlarging, necrotic lesion with undermined border and surrounding erythema characterize this disease. Linked to underlying systemic disease in 50% of cases, these lesions are commonly associated with inflammatory bowel disease, rheumatoid arthritis, hematologic malignancy, and monoclonal immunoglobulin A gammapathy.Recognition of the underlying disease is of paramount importance. Management of pyoderma gangrenosum ulcerations without correction of underlying systemic disorders is fraught with complication. A majority of patients receive systemic steroids or cyclosporine.Although medical management alone may slowly result in wound healing, many physicians advocate chemotherapy with aggressive wound care and skin graft coverage. Sabiston:- Extraintestinal manifestations of ulcerative colitis include arthritis, ankylosing spondylitis, erythema nodosum, pyoderma gangrenosum, and primary sclerosing cholangitis. Arthritis, particularly of the knees, ankles, hips, and shoulders, occurs in about 20% of patients, typically in association with increased activity of the intestinal disease. Ankylosing spondylitis occurs in 3% to 5% of patients and is most prevalent in patients who are HLA-B27 positive or have a family history of ankylosing spondylitis. Erythema nodosum arises in 10% to 15% of patients with ulcerative colitis and often occurs in conjunction with peripheral arthropathy. Pyoderma gangrenosum typically presents on the pretibial region as an erythematous plaque that progresses into an ulcerated, painful wound. Most patients who develop this condition have underlying active inflammatory bowel disease. Arthritis, ankylosing spondylitis, erythema nodosum, and pyoderma gangrenosum typically improve or completely resolve after colectomy. Colectomy has no effect on the course of PSC. According to Harrison:- Pyoderma gangrenosum (PG) is seen in 1–12% of UC patients and less commonly in Crohn’s colitis. Although it usually presents after the diagnosis of IBD, PG may occur years before the onset of bowel symptoms, run a course independent of the bowel disease, respond poorly to colectomy, and even develop years after proctocolectomy. It is usually associated with severe disease. Lesions are commonly found on the dorsal surface of the feet and legs but may occur on the arms, chest, stoma, and even the face. PG usually begins as a pustule and then spreads concentrically to rapidly undermine healthy skin. Lesions then ulcerate, with violaceous edges surrounded by a margin of erythema. Centrally, they contain necrotic tissue with blood and exudates. Lesions may be single or multiple and grow as large as 30 cm. They are sometimes very difficult to treat and often require intravenous antibiotics, intravenous glucocorticoids, dapsone, azathioprine, thalidomide, intravenous cyclosporine, or infliximab. This entry was posted on May 27, 2011 at 9:25 pm	and is filed under Medical. Tagged: AIPGMEE MCQs, All india MD/MS entrance exams MCQs, Love & bailey MCQs, Medical MCQs, Multiple choice questions, pg mcqs, PGMEE MCQs, Sabiston MCQs, Schwartz MCQs, Surgery MCQs. You can follow any responses to this entry through the RSS 2.0 feed. You can leave a response, or trackback from your own site. it, you’re a great author. I will ensure that I bookmark your blog and will often come back later in life.